We provide cars/buses services WITH DRIVER in Shanghai. All of our cars and buses have 7/24 English/Chinese support from our bilingual travel coordinators. Some car drivers can speak English themselves, while other drivers are professional interpreters/guides, engineeers, or even culture/business consultants (refer to our Shanghai Safari land-based business class package). English-speaking BUS driver? In fact, most bus drivers in China are unlikely to be good English speakers at the same time. But OUR DRIVERS ARE DIFFERENT. They have experiences in working with global customers and have acquired the skill of communication. Most importantly, they have the best English support from our Bilingual Travel coordinators 24/7 to ensure the smooth operation for any English-speaking travel groups. How do we charge our service? We have very reasonable and transparent prices. 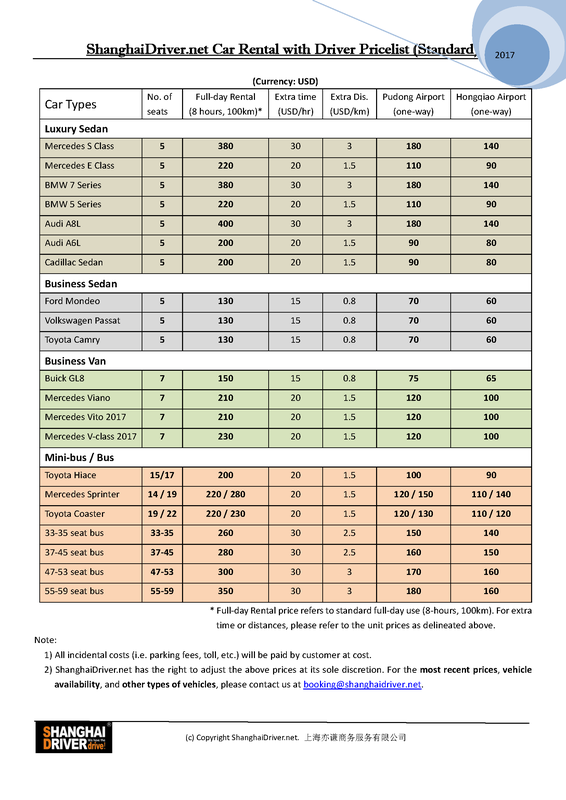 Click on the thumbnail image on the left to see our standard price list for some popular cars / buses. Use the table to estimate your cost. If you have a specific itinerary in mind, please send us your detailed requirements as soon as possible and we can give you a price estimate. What can you expect from our Car Service + driver package? First of all, our English/Chinese bilingual travel coordinators maintain strong communication with our global customers regarding their specific requirements and make clear plans and instructions for drivers. With many years safe-driving experience, our nice and polite drivers can easily understand customers’ intentions. Some drivers can speak English. All of the cars/buses are in good condition and well-maintained. They are very clean with non-smoking interiors. All of the cars/buses have 24/7 English/Chinese bilingual Travel Coordinators’ instantly-available support during the trip. Some discount prices for certain long-distance travels. MEMBER PRICES available for regular customers upon request. Where we can drive to? Our destinations are totally customizable. 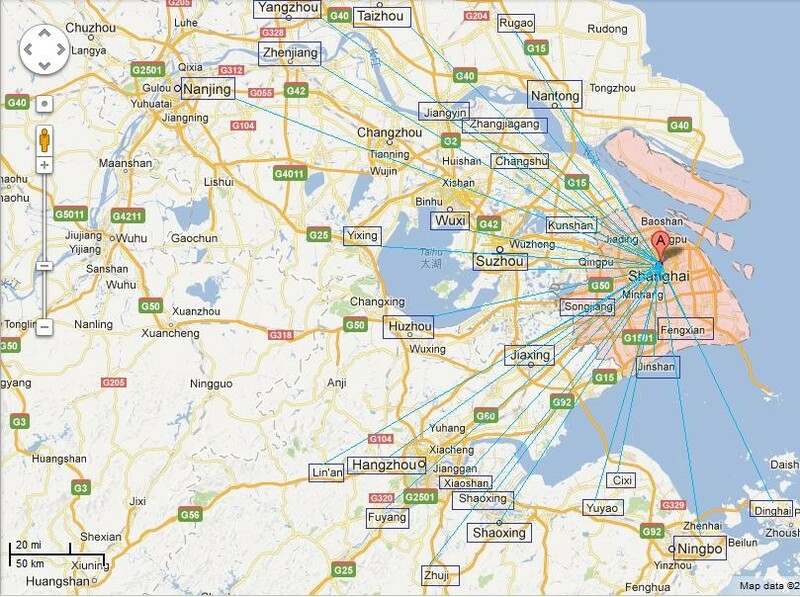 We are based in Shanghai but we can drive to anywhere within 500km of Shanghai. Squared in the map are some of the places we’ve visited before. Tell us your destinations. Special package for Car/Driver + GUIDE/INTERPRETER for travel groups. With only an extra of USD100-200, you can get a separate professional interpreter/guide travel with you. Your savings in time and money can be worth much more than the added expense. Especially when your group is not familiar with China, a local expert companion is the key to the comfort of the whole group. For any request, Click here to contact us.